Every woman longs for a dream pregnancy. A 40-week, worry-free time where everything goes as planned. But 1 out of every 10 infants in the United States is born prematurely. And when a baby has had less time to develop in the womb, he or she is often born with problems. That’s because many organs, including the brain, lungs, and liver, are still developing in the final weeks of pregnancy. Problems range from mild to severe, and can include breathing and feeding problems, cerebral palsy, developmental delays, and vision and hearing problems. Preterm birth is the greatest contributor to infant death. Most of the deaths occur among babies born prior to 32 weeks of pregnancy. Being younger than 19 or older than 40. Having a low maternal income or socioeconomic status. Having an infection or chronic condition, such as diabetes. Having a previous preterm birth. Having high blood pressure during pregnancy. Using tobacco or alcohol during pregnancy. Going through a stressful event during pregnancy. Can premature birth be prevented? Don’t smoke. If you do, quit now. For help, speak to your doctor for support. Don’t use alcohol or drugs. Go to your doctor for prenatal care as soon as you suspect you’re pregnant. Keep all your appointments throughout your pregnancy. Get treated for any chronic conditions you may have. Premature babies need special care. A neonatal intensive care unit (NICU) is a nursery in the hospital that specializes in the care of preemies. The health care providers who work there have specialized training and equipment designed to provide the infant’s basic needs. They include warmth, nutrition, and protection. This ensures that your baby will get the best possible care for his proper growth and development. You will be able to get involved in your baby’s care, even if he or she is in the NICU. Premature babies are unable to feed directly from the breast or bottle until they’re 32 to 34 weeks gestational age. Breast milk can be pumped by the mother and fed to the infant through a tube. Breast milk has a distinct advantage over formula: It contains antibodies to help protect your baby from infections his immature immune system can’t fight off. Because premature babies need more nutrition than full-term infants, vitamins and minerals may be added to breast milk or formula. Once your baby’s systems are more developed and can work on their own, he or she will be able to go home. The baby may still require special care, especially if he or she was very small at birth. You’ll see plenty of specialists when your baby is in the NICU. Be sure to ask them any questions you have. Once your baby is released to go home, you’ll need to see a doctor right away. The doctor will check your baby’s weight and make sure everything is going well at home. At each of your baby’s well visits, he or she will check on your baby’s growth, and use a special growth chart for premature babies to track his growth. It may be slower than a full-term baby’s. Don’t worry, though; most premature babies catch up with full-time babies after the first 2 years. Touch base with your doctor about feeding your baby. Breast milk is always best. 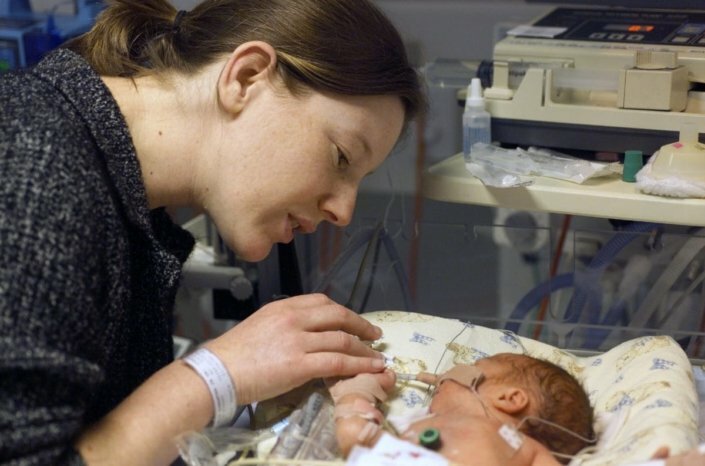 Premature babies can have issues with sucking or latching on. Ask your doctor for help, or for a recommendation of a lactation consultant if necessary. Certain vision and hearing issues are more common in premature babies. Crossed eyes (or strabismus), for example, will often go away on its own. Speak to your doctor, who may recommend you take your baby to an eye doctor. Retinopathy of prematurity (ROP), a condition in which the small blood vessels in the eye grow abnormally, can occur in babies who were born at or before 32 weeks of pregnancy. Premature babies are also more likely to have hearing issues. Speak to your doctor if your baby fails to react to loud noises. Your doctor will also pay careful attention to your baby’s developmental milestones. Motor skills like smiling, sitting, and walking will be closely monitored as he grows. How much should my baby be eating and how often? How much should my baby be sleeping and how often? What is my baby’s gestational age? What developmental milestones should I be looking for and when? How do I protect my baby from getting sick? Should others in the house get any special vaccinations? When can I take my baby out in public? How can I properly position my baby in his car seat? Are there any special concerns about vaccinations since my baby was born prematurely?